‘The Beautiful Indifference’ is a collection of short stories, where place and time is as important as character or plot. Here are eight stories that fit well together, to form a cohesive collection that looks at the Human condition in all of its forms. The stories are about friendships across the divide, or relationships that are in their final throes, or the travails of moving to a new place to start again. Most of the stories contain a twist at the end, which means that re-reading them prepares a completely different experience for the reader. The opening, and longest story, Butcher’s Perfume looks at the friendship of two very different schoolgirls, and the influence that they have over each other’s lives. The writing and descriptions in this story are the most vivid, and the way in which the timid, and lonely narrator becomes firm friends with the bully, Manda Slessor, and her family, whose reputation precedes them is both believable and all too human. The Beautiful Indifference looks at a relationship, on its last legs, as the narrator meets her much younger lover for what will be a last weekend. The Bees is a look at life in London, and how one friend can make all of the distance, whilst The Agency looks a company providing a different type of companionship. 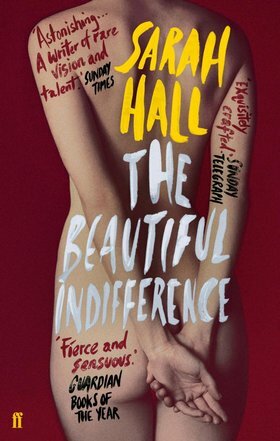 Sarah Hall earned her reputation as a writer with such novels as Haweswater, and The Electric Michelangelo, and The Beautiful Indifference can sit next to those two books, in terms of writing style, and characterisation, and moving story-telling. If you like quality short stories, this book should be carefully considered. With a naked chick on the book’s cover I would have guessed it was a collection of stories on erotica, not the human condition, but that’s ok. I mean life stuff is more fulfilling to read than the whole manhood goes into womanhood sweat dripping off naked flesh melting together like a grilled cheese sandwich on the space time continuum traversing the speed of moaning delight thrusting past gravity into a black hole’s loving embrace. In any case, sounds like a compelling book that is articulately written. I’ll look for it. Thx for the review!